Advantages when ordering at IPC-Computer? We are official spare parts dealer of many notebook manufacturers, including Acer, Asus, Dell, HP, Lenovo and many more. Only displays of best quality from well-known manufacturers such as LG, Samsung, Chi Mei, AU Optronics, InnoLux, etc. Risk-free use through our quality assurance and service promise. 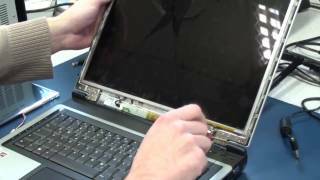 Display replacement in our in-house notebook repair workshop at reasonable prices. Free technical support surrounding the topic of display exchange. Signs of a display defect can take on a wide variety of dimensions. This can be a cracked or broken screen, but also stripes, flickering or dark spots. This damage is usually caused by a fall or other mechanical impact. Single pixel errors are pixels that either show no or the wrong color. A completely black image does not necessarily indicate a display error. The defect can also have another cause. 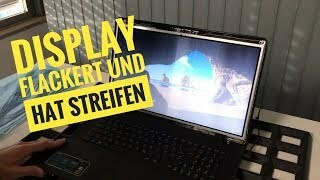 How do I find the suitable display for my laptop? The easiest and most efficient way to find the right display is via the manufacturer/model navigation. With the blue box in the upper left corner you can choose your laptop model. All compatible displays will then be shown. For the display to be compatible with your laptop, the resolution must also be the right one. 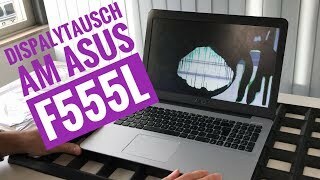 There may be different versions of the same laptop model. You can find the appropriate resolution for your new display in Windows under Settings under "Screen Resolution". With a matt display, the surface is roughened so that reflections in the display are greatly reduced. This can be particularly useful in bright rooms or outdoors. Glossy displays have a smooth surface, which makes the image appear sharper. Colours and contrast are also better. Such a surface is often used in professional monitors for film and photo processing. In most cases, we offer displays with both matt and glossy surfaces. So you can decide for yourself which of these two options you prefer. 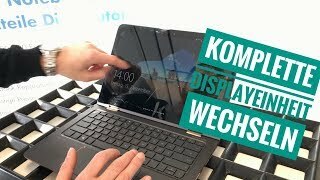 Defektes Notebook Display - Displayeinheit zu teuer - über 400 EUR sparen! In order to replace your defective display at home, you should have sufficient technical know-how. In addition, a removal guide specially designed for your laptop would be useful. 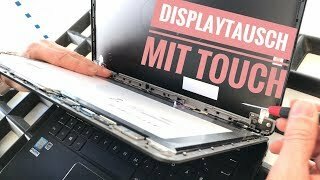 In general, however, we recommend that you have the display replaced by our experienced notebook technician. This is not much more expensive than a simple display purchase. In addition, you can be completely sure that your display will function perfectly afterwards. To get an idea of what such a display exchange can look like, we have filmed some repairs for you on our YouTube channel. Here you will find all important questions and answers concerning notebook displays. Can I swap my notebook display myself? 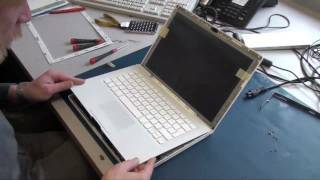 With a bit of technical knowledge and a manual specific to your notebook this could be possible. We recommend letting a specialist do it. 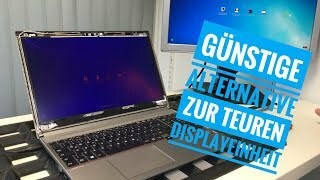 How can I find the correct Display for my Notebook? You can measure the diagonal of your display by measuring from one corner to the opposite one. If you need to you can then convert it from cm to inches or vice versa (1 inch = 2,54 cm) to get the desired measurement. Some sticker on the device can also contain further information about the Display. 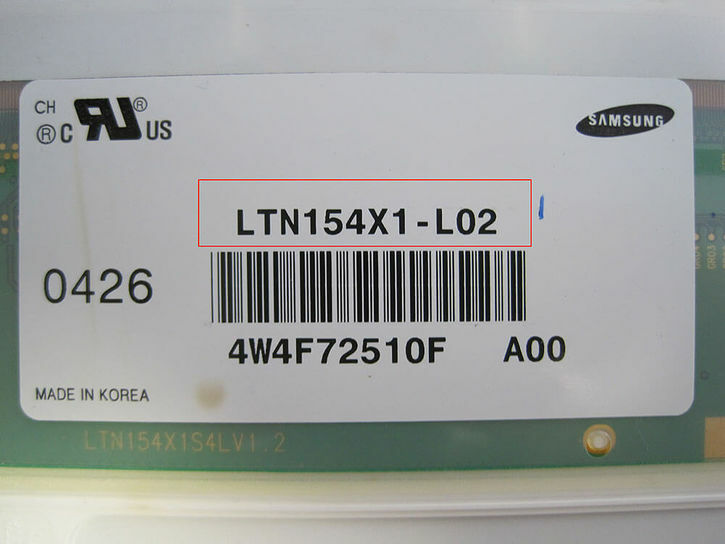 If you can not find any information you will have to remove the display to see its part number on the back. 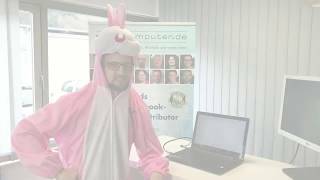 How can I measure the size of my notebook display? You have to measure the diagonal of your display by measuring from one corner to the opposite one. You might have to convert from cm to inches. 1 inch is 2,54 cm, so a 19" display would also be a 48cm display. How can I recognize a pixel error in my Display? When manufacturing a Display there can be errors in some pixels. This will result in the pixel or sub-pixel not letting any light pass or never blocking light. If a complete pixel is defective it will either be black or white. However, the same error can also occur in a subpixel, which will then result in it always/never displaying its respective color (either red, green or blue). Due to the very high number of pixels such errors are almost impossible to avoid, and that is why displays with a few pixel errors are still shipped. Vertical or horizontal lines are almost always a sign for a display damage. A display damage is also indicated by lines that (dis-)appear when the display is pressed on. In this case the display has to be exchanged. My Display is flickering, do I need a new one? In most cases a flickering of the display indicates its defect, then it will have to be swapped. In some cases it can be the display cable, then the display will not have to be exchanged. What are the differences between digitizer, display units and displays? The digitizer is a part of the display; however, it does not display any images. Its main function is to protect the LCD underneath and it also handles touch input, if touch is present. The LCD unit underneath the digitizer consists of the backlight and the LCD, which handles the colors of each pixel. The display unit is all of this together. So, it contains the digitizer, LCD, backlight and usually a frame around all of it. 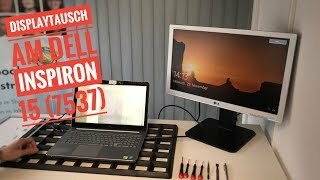 What displays are compatible with my Notebook? 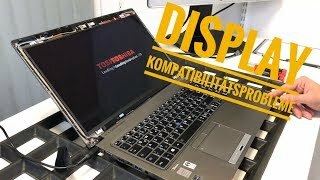 Only displays that are specifically made for your notebook are compatible. There are displays with different kinds of backlights. Either CCFL or LED lights are used only the type that is already in use will fit. Size and resolution also have to be identical. What is the difference between IPS and TN? TN, short form of Twisted Newmatic, panels have been the standard for flat-panel displays for a long time. Now they are being replaced by IPS (In-Plane-Switching) panels. The biggest disadvantage of TN panels is, that they only display a relatively small number of colours and that they have bad viewing angles. That means that if you don?t look at the panel in a 90° angel the colours quickly appear dull and distorted. IPS displays solve these problems, they even show correct colours when looking at them almost at a 180° angle. However they still have some disadvantages compared to TN panels. They generally have a higher response time which means they take longer to display an image on screen. This is why gamers sometimes still prefer TN panels. Where can I find the part number of my display? The part number can be found on the back of your Display, however finding it requires disassembly of your notebook. 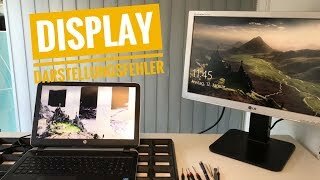 Which display resolutions are there? Nowadays, there are dozens of slightly different display resolutions for laptops and monitors. In order to stay on top of things, we created an overview of the most important ones. Why is IPC only offering the Display repair in their won shop and not selling the Displays themselves? Only when repairing ourselves we can guarantee, that the display will work 100% correctly with your device. A lot of big companies use a custom firmware on their displays, this is why a replacement unit, even if physically compatible might not work as expected. However Displays are still listed in our shop, but not under the page of the notebook model, but rather by the part number specific to each notebook manufacturer. Why is my Display extremely dark? If the Display is black, but the Desktop can still be seen a bit, this means, that the background light has died. There could be a damage on the Mainboard. In most cases it is probably best if you send your device in for repair to a specialist.